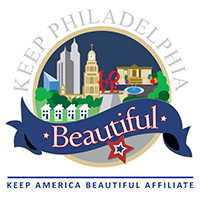 A proud affiliate of Keep America Beautiful, Keep Philadelphia Beautiful assists communities in the improvement of the physical and visual aspects of neighborhood environments. We are focused on civic engagement, litter prevention, waste reduction, and recycling education and promotion. We also work to connect Philadelphia residents and community based organizations to City government. Read our 2014, 2015, 2016 and 2017 Annual Reports – and learn about how to partner with us here!